Meghan Wiczynski - How to properly Dry Brush & why it’s IMPORTANT! How to properly Dry Brush & why it’s IMPORTANT! Home/Uncategorized/How to properly Dry Brush & why it’s IMPORTANT! While healing my thyroid, it was recommended I start “dry brushing”. Honestly, I had NEVER heard the term before and when told what it was I thought, “eh I’ll skip that part!” It wasn’t until I really hit rock bottom that I realized I needed to give this a try. Two weeks in to dry brushing and I’m addicted! I can feel my circulation working MUCH better along with my skin feeling so much softer! So why is dry brushing important?? 1. It stimulates your lymphatic system! This helps you avoid getting sick and aids in eliminating toxins from your body! 2. It helps you EXFOLIATE! Dry brushing removes the dead skin (sick right? ), opens up your pores AND gives your skin that nice glow look to it. 3. Increases circulation so that you are no longer freezing all the time! Your blood will actually flow to those feet and hands 😉 It also encourages the elimination of metabolic waste. 4. Stress Relief! It helps you calm your mind & reduce muscle tension when done in a warm, quiet place. 6. It’s ADDICTING! If you need something to be addicted to, this is the perfect thing! It’s one of those things that just feels so good and IS so good for you! First you’ll need a high-quality dry brush. Look for one with bristles made from natural materials. They should feel stiff but not overly so. Ideally, choose a brush with a long handle so you can reach your entire back and other hard-to-reach spots. You can find the brush I use by clicking here ! 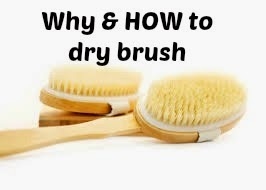 Dry skin brushing should be done daily for best results, or even twice a day if you like. Try incorporating it into your normal daily routine, such as doing your brushing before your morning shower and then again after work (avoid doing it too close to bedtime, as it may leave you feeling energized). I always do mine as soon as I shower in the morning so it gets me feel energized, refreshed and read to take on the day! When brushing, always brush toward your heart, which is best for circulation and your lymphatic system. You can brush your entire body (including the soles of your feet). Start at your feet and work your way up your legs to your arms, chest, back, and stomach. Avoid brushing your face (unless you have a special brush designed for this delicate skin)! The pressure you apply while brushing your skin should be firm but not painful (avoid “scrubbing”). Your skin should be pink after a session (not red or irritated) and you can brush for as long (or as little) as you’d like. An average dry brushing session may last between two and 20 minutes. Mine usually is about 2-3 which is about how long I can get myself to stand still! Hope this is helpful! I know by adding it in to my daily routine, I have already seen so many changes in the glow of my skin as well as my energy levels. Excited for you to try it out!! Jicama Fries–low cal & nutrient dense snack! ADRENAL FATIGUE…Do you have it?? P90. Is this for YOU? Week 1 Autoimmune Paleo Calendar and Recipes!